ArmaLite's Super SASS is an AR-10-based 7.62mm sniper rifle originally developed for military use. It wasn't so very long ago that the American military sniper community was what could best be described as "closed minded" when it came to semiauto sniper rifles. During this happy period following the end of the Cold War, both the Army and Marines were quite content with their Remington 700-based bolt-action sniper rifles. Back then, semiauto sniper rifles were scoffed at and derided as "only being suitable for poorly trained conscripts from the East." However, combat experience in both Afghanistan and Iraq quickly demonstrated the usefulness of a self-loading 7.62mm sniper rifle, especially if it was able to be easily configured to meet specific mission requirements. It wasn't long after that trials were held to select a new Semi-Automatic Sniper System, or SASS, which was subsequently adopted by the U.S. Army and Marine Corps. ArmaLite Inc. was one of several companies that developed and submitted an entry for the XM110 competition. Although ArmaLite's entry was not selected by the military, the company continued development and introduced what it calls the Super SASS in .308 Winchester at the 2006 SHOT Show for commercial sales. As to be expected, this new model is based upon ArmaLite's well-known AR-10 action. Mated to this is a stainless steel match barrel. This has a 1:11 1/4-inch twist, optimizing it for use with 175-grain and similar-weight projectiles. Mounted to the muzzle of the heavy-profile barrel is an A2-type flash suppressor. To further enhance accuracy, the match barrel is free-floated via a robust aluminum handguard system. The handguard itself is heavily ventilated to both reduce weight and allow air to easily pass over a hot barrel. In order to allow mission-essential gear to be easily mounted, the rail incorporates four 1913 rails at 12, 3, 6 and 9 o'clock. One extremely important piece of equipment for the modern sniper is a sound suppressor. To allow one to be easily mounted, ArmaLite has fitted the Super SASS with an Advanced Armament fast-attach suppressor mount. This system allows a sound suppressor to be installed or removed with just one hand in less than three seconds. Live in a place where sound suppressors are not legal, or just don't want to take the time to submit the paperwork? Not a problem: ArmaLite has a dummy suppressor that is an exact copy of the real deal for display purposes. That said, suppressors are inexpensive and the paperwork relatively painless, so I suggest getting the real thing. As shooting through a suppressor can upset the happy balance of a direct gas system's Chi, ArmaLite specifically addressed this issue. Its solution was to design an adjustable gas system specifically for this application. Now, adjustable gas systems on self-loading sniper rifles are nothing new. Both the Soviet SVD and Yugoslav/Serb M76 sniper rifles incorporate adjustable gas systems. However, they are unusual on Stoner's direct gas system outside of competition rifles. That said, ArmaLite designed a beefy steel gas block and mounted it via two steel crosspins. The traditional Stoner gas tube attaches to the rear of this via robust threaded fittings. At the front of the gas block is a two-position adjustment knob that can be rotated to Normal or Suppressed settings. The front of the adjustment knob is machined to allow a cartridge rim to be utilized for added leverage. The end result is a simple design, with only two positions, to allow trouble-free use with a suppressor mounted. In addition, a PRI Gasbuster charging handle has been fitted to make suppressor use a little friendlier to the shooter. To make the rifle as ergonomic as a bolt-action sniper rifle, an adjustable Magpul Precision Rifle Stock is fitted. This robust unit is adjustable for length of pull and has a cheekpiece adjustable for height. Adjustments are made via thumbwheels with distinct clicks. Tension on these adjusters is heavy enough to prevent their accidental rotation. The stock allows a shooter to configure the rifle to fit his frame size, whether he is using the Leupold 3.5-10x40mm LR/T tactical scope or the adjustable backup iron sights. Another improvement ArmaLite has made is the introduction of a new 20-round magazine design. This is intended to improve reliability over the previous standard, and still interchangeable, model. 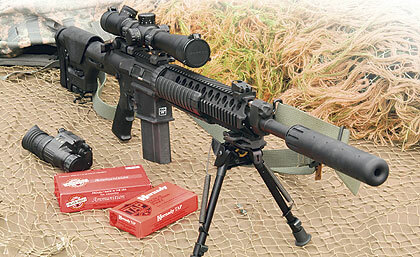 I first had a chance to play with ArmaLite's new sniper on PASA Park's 600-yard line. Lying in the dirt with it, I found that the rifle proved quite comfortable to shoot and had no problem knocking over LaRue sniper targets using generic Winchester white-box ball. Actually, with about 12 LaRues spread from approximately 200 to 600 yards, the challenge was how quickly you could knock them all over. It is at these distances engaging multiple targets that the Super SASS really kicks dirt in a bolt gun's face. Although Americans love to wax poetic about 1,000-yard sniper shots, the harsh reality of Iraq has been deadly engagements at substantially shorter distances. Shots past 600 yards in Iraq, although they do indeed happen, are not the norm. Is the Super SASS capable of reaching past 600 yards with a quality match load? Without a doubt, while at the same time posting tighter groups than our Jihadist enemies' 7.62x54R sniper rifles are capable of. Back home in Maine a fellow Master-class High Power shooter, Gus Norcross, and I put a different Super SASS to work on paper at 100 yards. Shooting off the bipod using Hornady 168-grain TAP, this rifle averaged .8 inch for four consecutive five-shot groups. The only negative comment I have is that the review rifle failed to lock the bolt open on the last shot due to a faulty magazine. My thoughts? Sniper-rifle innovation stagnated in the United States for the decade leading up to the Global War on Terrorism while everyone did the 700 dance. Now things are slowly moving forward again. In my mind, a military bolt-action sniper rifle should be chambered in .338 Lapua Magnum, not 7.62mm. These should be complemented by semiautomatic sniper rifles in 7.62mm. ArmaLite's Super SASS is a step toward the future rather than another variation of the same jig we have been dancing since the 1960s. Is it perfect? No, but it is the direction in which we should be heading. If the Super SASS strikes your fancy, the bare rifle (with dummy suppressor) is available for $2,828. If your wallet goes deep, you can buy a complete kit with BUIS, Leupold scope mounted in ARMS rings, Harris bipod with QD adapter, three rail covers, sling, cleaning kit, starlight case, dummy suppressor and a 10- and 20-round magazine. Price? The complete kit will lighten your money roll a hefty $5,261. For more information contact ArmaLite at (800) 336-0184, www.armalite.com.